Does China mean to conquer the world? 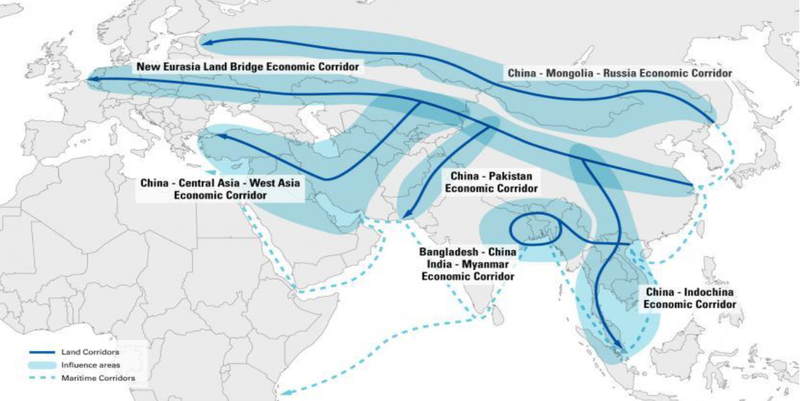 Many western observers, seeing the scale and ambition of China’s infrastructure plans in 86 countries and over US$1 trillion of projects, have concluded that it is a sinister plan to dominate Eurasia and beyond. This essay attempts to look at these projects objectively and draw some conclusions about their impact on the world, and on China itself. 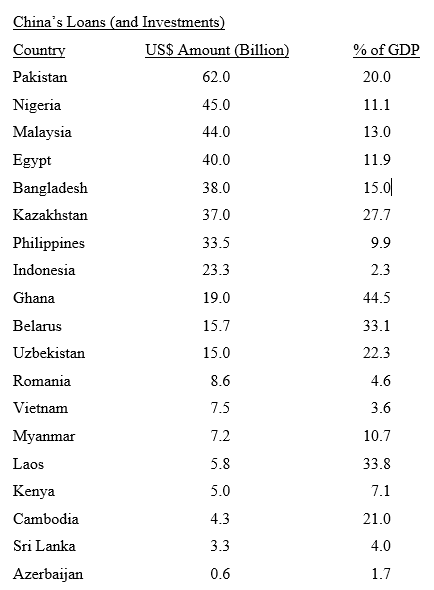 The following table shows the countries with the largest commitment by Chinese banks and construction companies. 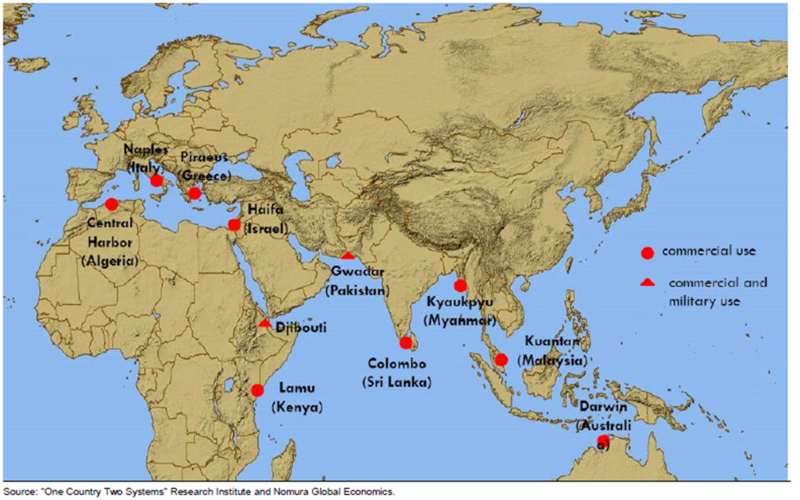 What may be observed from this list is the heavy concentration on South Asia and Southeast Asia (Pakistan, Bangladesh, Malaysia, Philippines, Indonesia, Vietnam, Laos, and Cambodia, also Sri Lanka); but, in addition, for Chinese geopolitical reasons, there is a strong focus on Central Asia (Kazakhstan, Uzbekistan) and even some of the old Soviet-zone states like Belarus and Romania. Equally important to the Chinese is their very strong commitment to Africa, which President Xi Jinping, the architect of the “One Belt One Road,” emphasized last week in the Sino-African Beijing Summit. The total Chinese investment in Africa will amount to US$60 billion this year alone, and nearer US$200 billion in total. As we have observed in the past, the Chinese influence on the smaller economies is extraordinarily powerful. The example of Sri Lanka, which I visited last year, is a telling one, where the total investment promised will exceed US$10 billion (Sri Lanka’s GDP is US$60 billion). Already, Sri Lanka owes US$8 billion to Chinese banks and has agreed to a cancellation of about US$1 billion in debt in exchange for China getting a 99-year lease on the 11-square-kilometer special economic zone around the port of Hambantota. As in Djibouti and, perhaps in Pakistan, China is essentially gaining ownership of key strategic locations, especially ports, around the Indian Ocean, which serve its long-term purpose of protecting its sea lanes, especially the route of oil tankers coming from the Persian Gulf through the Malacca Straits and into the South China Sea. China has a two-fold objective to gain goodwill and long-term economic advantages in a strong financial and trading relationship with many emerging countries in Central Asia, as well as Africa and even Eastern Europe, which over the long term, will give it a powerful geopolitical presence and, perhaps, export markets for Chinese products to these countries. The difficulty is that many of the loans which accompany the projects to build railways, ports, pipelines, even highways and, very often, airports and presidential mansions, are usually impossible to repay because of the weak economic conditions, for example, in African nations. China, thus, obtains a strong position as a dominant creditor even though, as we have seen in Sri Lanka, in Malaysia, and in Pakistan recently, a change of government brings to power a new administration which tries to either renege on, or renegotiate, these overwhelming Chinese loans. Prime Minister Mahathir of Malaysia, who came back to power recently at the age of 92, has attempted to stop the construction of an east coast highway and also a vast Chinese offshore city of nearly 1 million “colonists” in Johor. Although all these emerging countries desperately want foreign investment, it does not always benefit them greatly to see the arrival of large Chinese projects, financed by Chinese banks and built almost entirely by Chinese engineers and workers, and then coming under Chinese ownership once they are completed. There are many unanswered questions about this key strategy of the current Chinese president. Will military muscle be required to back up the trading and financial presence of Chinese workers and companies? The example of Djibouti is interesting in that, for the first time, China has built a military base on the continent of Africa with a clear plan to emulate American, French, or British policies in the past where a special forces group can enforce action locally to protect Chinese citizens or projects (the recent case in the Sudan of 2,000 Chinese workers being evacuated) has perhaps stimulated this action. As investors, we have to try to assess what all this means. Will Chinese banks suffer from non-performing loans from these emerging countries? Is the return on investment of the Chinese engineering companies, notably railways, going to be adequate? What if the Chinese economy itself slows down and these small emerging markets are heavily dependent on Chinese investment and trade? It is clearly in China’s interest to export its overcapacity of steel and other key materials, as well as large teams of Chinese workers. The world has never seen anything quite like this before. Some observers compare it to the Marshall Plan, which the US directed towards the impoverished nations of Europe in 1948; but the scale and the purpose are quite different. The only real parallel is that just as a market for US goods was created by stimulating the European post-war economies, so too China will gain markets by pumping capital into Africa, Central Asia, and so on. But the key question remaining is, “How will China get repaid?” When Imran Khan was recently elected Prime Minister of Pakistan, he found an outstanding debt to China of US$60 billion and requested funds from the IMF to help repay the loans; but President Trump has put his foot down and refused to fund IMF repayments to China. Could a similar situation cause a financial crisis or even currency volatility in the emerging markets? We are convinced that China’s long-term strategy is a peaceful one; and just as they have focused with single-minded energy an on rebuilding their own economy after Mao, so their rhetoric suggests that they have every good intention to rebuild the struggling economies of the third world. Certainly, one motive is also to obtain a supply of key commodities, such as oil, gas and minerals, as well as food, from Africa. If this massive Chinese global building project continues, we would expect that demand for, and prices of, key commodities will remain firm in the next few years, even though the infrastructure demands within China itself are lessening. For instance, the investment in railways in Southeast Asia, and in countries like Bangladesh, will only further enhance Chinese competence in railway building. The last month has been a tough time for investors in Asia; but within the next 4 weeks, we expect to see light at the end of the tunnel. First of all, the US and China will reach a deal on trade; and this will lead to a strong 4th quarter rally in oversold Asian markets and currencies, especially China. The Shanghai A Share Market is now on a forward PE of 10 times, and foreign institutions continue to put in capital (the MSCI just increased exposure of A Shares in its Emerging Markets Index from 2.5 to 5% of all A Shares, and an estimated US$17 billion has been invested from overseas). India, too, is resilient, with the local market rising 11% in rupee terms this year, while the dollar’s strength has largely eliminated this return to international investors. We expect that strong fundamentals – trade, current account, pro-business policies, continuity after May 2019 elections, and average corporate earnings of 25% – will prevail over time; and that the Indian rupee’s temporary weakness, caused by the contagion of Turkey and Argentina, will prove short-lived. Our outlook for 2019 remains for robust growth in Asia, including ASEAN. Another important development is the growing shift of manufacturers from China towards Vietnam, Bangladesh, Cambodia, and Indonesia, especially for clothing and textiles; and for office and telecom equipment to Malaysia, Singapore, and Vietnam. Exports and economic growth will pick up strongly, especially in low-wage nations like Vietnam and Cambodia. This results both from China’s higher factory (labour) costs and from Trump’s tariffs, but it is worth emphasizing that China still accounts for over a third of global clothing and telecom exports.